For today's store tour, we're heading back up to the Rockland/Westchester County, NY area to the city of White Plains, NY. White Plains is the major hub (and county seat) of the generally affluent Westchester County; however, the city itself has some lower-income neighborhoods. One of them contains this small supermarket, the independent Greenside Market. 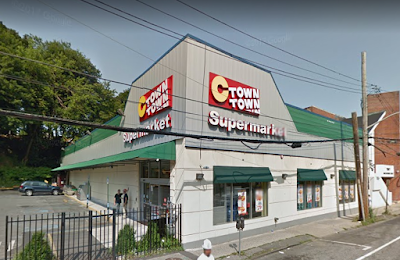 It opened as a C-Town around 2012, which makes sense because Krasdale Foods (which operates C-Town supermarkets) has its headquarters in White Plains. As usual, this 2014 street view is from Google Maps. C-Town closed or converted to Greenside soon after. The new store combined with the pretty spiffy exterior gave me high hopes for the interior. However, upon walking inside, I encountered a pretty sad store that obviously isn't doing the volume it needs to, but also that isn't stocking the number of products it should. 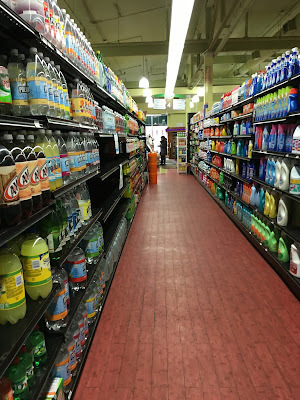 Produce is in the first aisle, with meat along the back wall, frozen and dairy in the last aisle, and deli along the front wall (facing the street) -- pretty standard layout for an urban store. While most of the fixtures and decor in the store are almost brand new, it is likely not making the money it should, and it shows. Many of the produce cases were filled with random drinks and a lot of beer. That case at the front may have held flowers at one time. Looking towards the entrance. Plenty of beer! Meat along the back wall, with the service counter in the far corner. 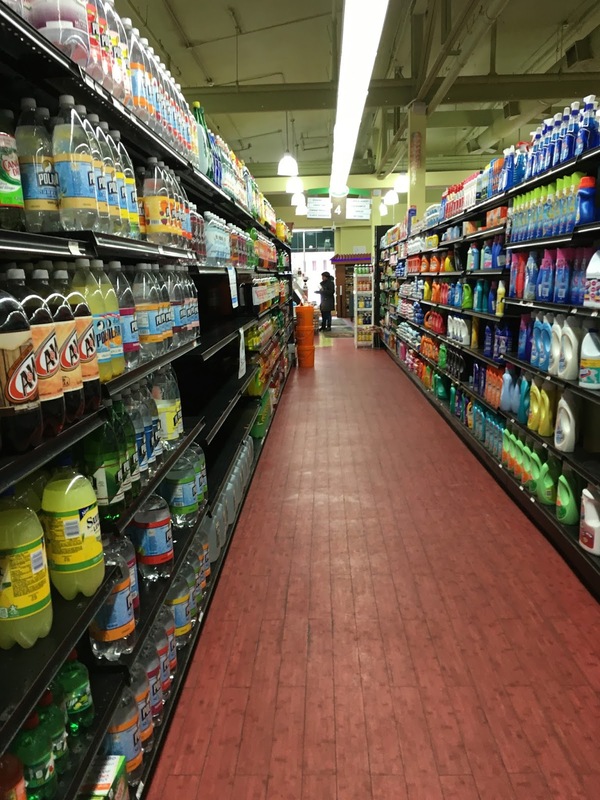 Many of the grocery shelves were either empty or stocked only one or two products deep. This suggests to me that the store either keeps very little product on hand because they know they don't do high volume, or has trouble getting deliveries from their wholesaler(s), which happens sometimes. Also there was no circular, giving the feeling (whether true or not) that it's a haphazard operation. Again, you can see large spaces on the shelves. Frozen and dairy in the last aisle. Unfortunately, this store seems to be struggling and not well equipped to handle the problems they are facing. It's a shame because the facility is very nice -- maybe a new operator could do better with this same space.